Madix understands convenience and liquor retailing. 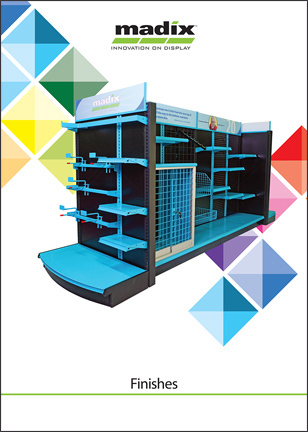 A leading innovator in the store fixture industry, Madix has a history of successfully helping retailers solve merchandising challenges. Making the most of the sales floor is one of the most difficult challenges met by convenience store retailers today. With smaller floor plans every square inch of space is more important. We offer products that help you utilize every centimeter of your sales floor. With smaller floor plans every square inch of space is more important. We offer products that help you utilize every centimeter of your sales floor. This means more products on display, and more selling opportunities per square foot. Customers want to get in and out as quickly as possible. With Madix fixtures, c-stores can increase sales with eye-catching displays that organize and improve product visibility. With unique accessories specially designed for merchandise, retailers can direct customers to the most profitable merchandise. Utilize promotional bins, freestanding aisle fixtures, and wire accessories to improve the bottom line. There's only one fixture company bringing any innovation and new ideas to market, and that's Madix. Drawing attention to merchandising categories can be challenging when you have little space on the sales floor. Madix offers a variety of signage and illuminated displays that draw attention to merchandise, using existing space. Maxi Line is famous for it's versatility, customizable options and accessories. Madix's Y-Gondola creates a perfect focal point for increased product sales. Customers want to get in and out as quickly as possible. With Madix fixtures, c-stores can increase sales with eye-catching displays that organize and improve product visibility. With unique accessories specifically designed for merchandise, retailers can direct customers to the most profitable merchandise. Utilize promotional bins, freestanding aisle fixtures, and wire accessories to improve the bottom line. LEDge Light is the first LED lighting product designed for display shelves.